It is needless to say that memory chips are an integral part of your phone and their quality and type influences the mount of RAM that your phone possesses. As it happens, Samsung is one of the worldwide leaders when it comes to the manufacturing of memory chips. And today they have made a very important announcement, one that will influence future development of mobile phones. The announcement regards the new 8Gb LPDDR4 mobile DRAM chip which is expected to me more efficient and faster. However, Samsung was not the first company to announce the 8 GB chip. SK Hynix announced this all the way back in June but their version used the LPDDR3 technology which is not as fast or efficient as the LPDDR4 one. The build of Samsung’s chip is on the 20-nm class process allowing it to reach 1 GB on a die. What this means, basically is that in the near future you will start seeing phones with up to 4 GB of RAM on the market. As you might have imagined, not every phone out there will be equipped with this type of technology (we would be left with no entry-level phones, right?). Only the high-end phones and tablets and the high-density displays will posses these chips. These could also include the future flagship phone from Samsung, the Galaxy S5. Their WQHD screens (with resolutions of 1440*2560 pixels) will not be the only reasons they will need more memory. Files are getting larger and to incorporate them means extra resources will be needed. A larger number of apps will be ran at the same time and battery life will increase significantly. 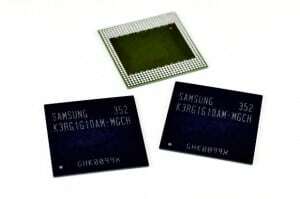 In fact, the new chip from Samsung will feature a 50% increase in performance compared to the LPDDR3 technology and will consume 40 percent less battery. In spite of what we said earlier, it is yet unclear whether the Samsung Galaxy S5 will benefit from this technology and come with 4GB of RAM. Dont get this the wrong way though: 3 GB is excellent and investing in a gadget with 3 GB of RAM means orientation towards the future when more memory will be needed. But 4 GB would still be better, right? With that being said, we, the guys at Samsung Update, would like to wish you a Happy New Year!